Knucklehead #1: A nineteen year old Georgetown University student, Daniel Harry Milzman, has been charged with possessing ricin. Milzman allegedly showed a resident adviser of McCarthy Hall a plastic bag with what he claimed was ricin. The resident adviser alerted authorities, Milzman arrested, and McCarthy Hall closed while the HazMat team that drew the short straws swept the building. Apparently no ricin was detected in the building, but the bagged substance did contain it. Milzman isolated ricin from castor beans using materials and equipment from local stores. Terrorism is not suspected. One news report can be found here (1). I’m going to go out on a limb and go with the “smart kid, very bored” defense. This is what dumb kids do. And yes, he’s nineteen, old enough to (legally) be handed a fully automatic weapon, but too young to (legally) drink. It’s an awkward time. And guys are dumb. Why’d he do it? Probably just to see if he could. He got the instructions off the internet, and it’s really not that hard. You could Google the instructions, but I wouldn’t if I were you. The NSA tracks these sorts of things. Crap! Now they’re tracking me. Time to bust out the tinfoil hats. Knucklehead #2: This guy actually meant harm. Nineteen year old Nicholas Helman, of Hatboro, Pennsylvania, applied ricin to a scratch-and-sniff card and sent it to his ex-girlfriend’s current boyfriend. He was caught when he bragged about the plot to one of his co-workers. Authorities recovered ricin from under a manhole cover in town, and he was subsequently charged with attempted murder. One news report can be found here (2). There is no word on exactly how he obtained the ricin, but my thoughts are he probably had internet access, too. Again, dumb kid. Nineteen. Too much time on his hands. He would have been better off spending the time meeting a new girlfriend than procuring ricin. On second thought, it’s probably best that he didn’t meet anyone else, as I’m sure that relationship would have soured, too. On the plus side he’ll have lots of dates in prison. I’m not trying to make light of the situation, he tried to kill someone. And poisoning someone isn’t an an impulsive act, like a shooting or stabbing. You have to obtain the poison, plan it out, deliver it. You have dozens of chances to say to yourself “what the hell am I doing?” So in my book, poisoners are the most sinister of murderers. So now we get to the part where I tell you what ricin is. Ricin, when pure, is a colorless powder isolated from the castor bean. Yes, that same bean that gives us castor oil, the old school laxative. If you have castor oil around, don’t fear because ricin is destroyed by heat and the process used to manufacture the oil. But pure ricin, that’s something else. 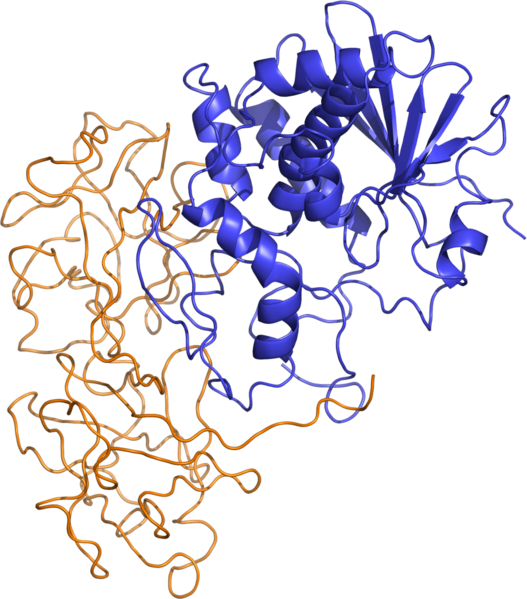 Ricin is a large, dimeric protein. How large? Try 65 kDa. That’s 430 times the molecular mass of acetaminophen. Approximately 1-5% of the castor bean is ricin, and while that seems small, only a tiny amount of pure ricin is needed to bring about death. The estimated dose to kill a human by inhalation, the preferred and most lethal route of administration, is only 0.5 mg, which is barely enough to see. Around the same dose is required for lethality when injected. A high-profile murder using ricin is that of Bulgarian writer Georgi Markov, who was killed in 1978 when he was injected with ricin from a poke of an umbrella. It has long been thought that the KGB was behind the killing. 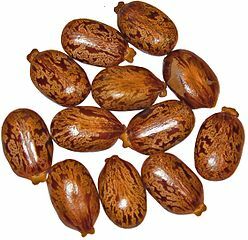 Orally, the lethal dose is much higher, around 50-75 mg, as ricin is destroyed in the gut, but consumption of as few as 8 castor beans can be lethal. So could ricin be weaponized and used as a tool for mass destruction, murder, and mayhem? Yes, yes, and yes. In fact, the United States attempted to weaponize ricin towards the end of WWI. They were unsuccessful at dispersing it by the time the war ended, but development sprang back up again in the 1940’s, and again in the 1980’s (4). It was even rumored that Iraq was developing ricin as a chemical weapon in the 1980’s, but that rumor was spread by the U.S., so use your best judgement with that one. The reason against using chemical or biological weapons is that they are indiscriminate killers, like ricin. Innocent and unintended victims are killed. So while I may joke that these two Knuckleheads are merely young and dumb, they posed a serious threat to everyone around them. I’m guessing the legal system will see it the same way, too, and we won’t be hearing from these fellas again for a very long time. 2. “More ricin found in Hatboro; neighbors say suspect was unassuming.” Philly.com. 22 Mar. 2014. http://articles.philly.com/2014-03-22/news/48442959_1_ricin-john-patrick-heckler. 3. Audi, J. “Ricin Poisoning: A Comprehensive Review.” JAMA: The Journal of the American Medical Association 294.18 (2005): 2342-351. 3. Shea, D., Gottron, F. “Ricin: Technical Background and Potential Role in Terrorism.” Congressional Research Service, 17 Apr. 2013. Tags: castor bean, ricin. Bookmark the permalink. Sorry to disagree but that should be No, no and yes. No, ricin is not a suitable tool for mass destruction. As you say, there was work on it in WWI but, a hundred years later, no-one has ever used it as mass weapon. Ni, ricin is not a useful murder weapon. The one well-known murder was Georgi Markov but people forget that his colleague, Valdimir Kostov, was attacked in Paris and came to no harm. (Incidentally, it wasn’t the umbrella but that’s a different story.) There are plenty of better ways to kill someone if that’s what you want to do. Yes, ricin is capable of causing mayhem because the reports of its potential do a better job of creating terror than the poison itself could ever achieve. Incidentally, the material found in Georgetown had a ricin content of 7.7 micrograms per milligram. That’s lower than your lowest estimate of 1% of the whole bean. That suggests that this foolish young man destroyed some of the ricin during his processing which is what would be expected from the Internet ‘recipes’. How about we split the difference and go with no, yes, yes? Mass destruction? No, of course not, buildings aren’t tumbling down, but people get the idea. I think more people in novels and TV have been killed with ricin than in real life. And the terror associated with it is very real. We had a slew of ricin letters sent to politicians in 2001/2002 here in the US. After the first couple of letters any time a letter looked suspicious the media and authorities cried “ricin!”. And yes, the Georgetown kid didn’t do it properly, thankfully. Same for the kid in PA, I’m guessing. Thanks for the comment! The Georgetown kid didn’t do it properly because the available recipes don’t work. Every ‘ricin letter’ story I’ve ever looked at turns out to be just crushed castor beans. And most of them are done by attention-seekers rather than people with serious murderous intent.